Discussion in 'SSDs & Data Storage' started by TeleFragger, Jan 18, 2019.
yeah this post wonders all over the place. hope you can follow!!!! hah sorry my adhd brain is on fire!!!!!!! fixed token ring cards and memory expansion cards. so with that all out of the way... lets get to the learning im after!!! my current job, they use what comes in the Lenovo systems... and they are just cruddy WD Blue drives. Is what it is.. but we deal with scientists and masses of data. I have told my coworkers that we need to look at SSD and I was told.. no too expensive. 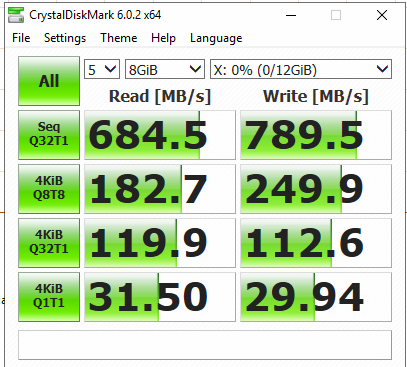 I took it upon myself to use anvil storage benchmark tool and started benchmarking ALL of our types of HD's... normal spinning sata drives, then our laptops that had the cruddy intel 180gb ssd's that were dying so much onto other things. we started getting a few SSD drives in for special requests and I started benchmarking them. with that we now put SSD drives in everything and now even the new Lenovo's are getting NVMe drives!!! WOOOT!!!! so so once again starting back up on the benchmarking of drives... BUT benchmarks are just that.. not real world to me. with my 10gb network, I have learned a lot and EniGmA1987 was there for a reading and push me forward. im not getting the numbers to make 10gb worth it to me... unless im missing the point and it isn't about file copies but more of say running multiple vms via 10gb link from iscsi freenas datastore to the esxi host???? so what is needed to really get storage speeds? how can I achieve closer to these numbers and not spend a fortune? I do photo and video editing and takes a while to copy files around... thus why this would be awesome-sauce!!!!! Now on your computer you are transferring files from, keep a RAM disk there for now. Put a test file in the ramdisk and send it to the server with the cache space. See if you max out your 10gb connection (should be around 1.2GB/s?). Post back here what speed you got. Next, remove the RAMdisk on your PC, and transfer the same file from your normal drive top the server. Post back what speed you get. This will be capped at whatever speed your drive read is capable of doing. If its a mechanical drive, that could be anything from 50MB/s to 300MB/s. If its a sata SSD, you could have anywhere from 100MB/s to 500MB/s. Its its a pcie nvme SSD, this may saturate your 10gb connection still. Once you do those tests and post back results, remove the cache from the server and do both tests again. Then post back your results without the cache. so that's is what I did here..
imDisk ram drive from pc to pc and got 680+ and no way near 1.2gb... but... when I go to copy files, that is where I'm seeing not even these numbers. Are you copying files from ramdisk to ramdisk, or just to/from a regular drive on one or both computers? And are the files large or small? It sounds like you already have your answer if ramdisk to ramdisk is fine. 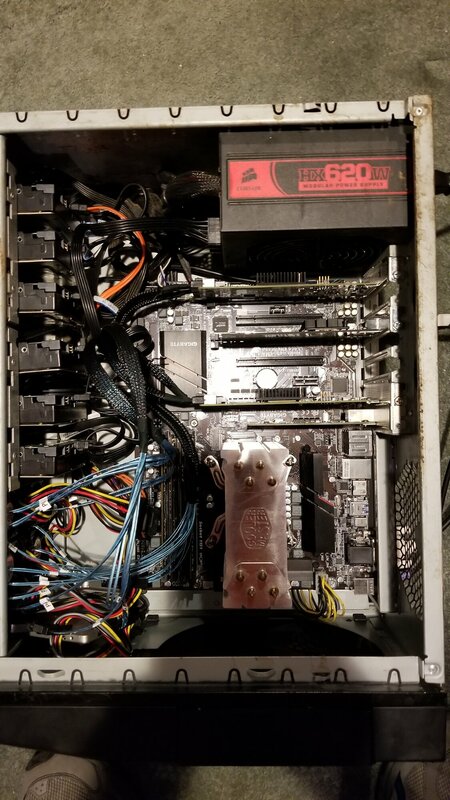 Your Network is good, your drives are too slow or connected to too slow sata interfaces. Upgrade to faster ssds if the systems support them and or implement some sort of performance oriented RAID. I think there may also be some translation confusion. Storage read/write speeds are in Bytes/Second. Network speeds are measured in Bits/Second. So when you see a storage speed of 685 MB/s, that is roughly the equivalent of 5.5 Gbps. You are never going to get an on par disk to disk level transfer over the network without massive cost expenses. so im trying to understand what I will need to do for drives. my plans are a freenas server. I have about 12x 500gb ssd, 6x 2tb wd black and 6x 1tb wd black drives. I get it.. wd red or ironwolf drives are preferred. Told WD black are a bad choice but I have them on hand and can use them now. gaming rig that I edit photos and videos. 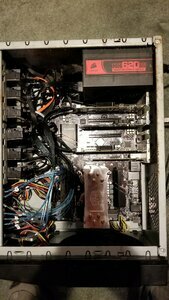 so im thinking a freenas box, lots of drives, ssd pool, wd black pool and go from there???? ramdisk to disk and I see the issues... SO that is why I started this thread... trying to understand drives for when you go to do 10gb... now is it because I chose a huge file vs many little files? I don't know. I need to figure out my overall game plan, start there, then start benchmarking. drescherjm and TeleFragger like this. Use iperf3 (there is Windows version) to test network throughput, to rule out network issue. In iperf I can see 9.5 - 9.6GBit/s, while in file copy you most likely could not see such numbers, you may monitor CPU usage. 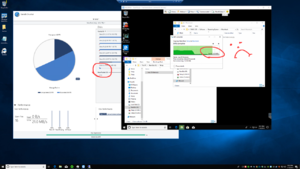 Then it's worth noting (as I noted in the other topic) that you may try to use something called Unbuffered copy to avoid Windows caches which has the side effect of this "wall" TeleFragger talks about. Some programs have the option to use unbuffered, other are smart enough to use unbuffered when you copy big files. TeraCopy seems to use unbuffered but I don't know if they use some filesize threshold. OK so this is a bit all over, im going to try to sum up and simplify..
1. Your concern with the Network, going to say now your Network looks absolutely fine. 2. Hitting a wall after so much of a file copy is probably the cache filling up then moving onto a slower transfer. (specially for RAMDISK to HDD) Dedicated storage systems have there own cache that will fill to 50% write to disk while filling the other 50% to help keep things moving, Windows not so much. 3. Your NAS plan, what is your priority? 3.1 Im going to guess its speed and redundancy? So RAID 6 with SSD's. If for your work, you could get 10k RPM Drives for something between 3.1 and 3.2. FInally your not going to get constant 10GB Network speeds, you will get that untill the cache fills up, and if your building this yourself and not using say a NetApp or EMC (as examples) system then your cache will fill up quickly and drop to the raw data speeds of the Drives in the RAID Config. If its for home use, sure thing get a NAS, and any drives will work, the only recommendation i would have is keep them the same model/make and try to get drives from different batches to reduce the likely hood of them all failing at the same time. 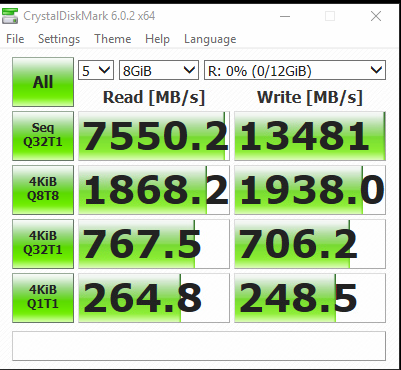 One last thing, with SSDs there is a cutoff point when speed will drop dramatically dependant on the space used. Just something to keep in mind. That 961MB/s is somewhat close to 1GB/s. And by the end of the transfer it had climbed to 991MB/s. It is just hard to take a screenshot because the file is 3GB and it is done so far I cant really get a good screencap of the transfer. Anyway, pretty close to the network throughput. But then I was thinking that I thought I had this higher before. I realized I had reinstalled the OS on the server a month or two ago, and I never re-tuned the network. So I went ahead and tuned the driver settings and re-ran the tests. There we go! much better. So as you can see, without cache everything is stupid slow. With cache, everything is like running a local NVME drive in speed but over the network. Which isnt a coincidence, cause I am using a 970 EVO 1TB +16GB of DDR-3600 RAM as the cache on the server. 9.5/10 files I transfer fit within the RAM cache space, but even when I transfer 80GB files I never see speed drop down. This is because the 1TB nvme has an SLC cache of a few dozen GB worth that runs at 3.5GB/s which is faster than my transfers go anyway. So I never really get any slowdown unless I am doing a mega sized transfer of a few hundred GB all at once. Which is like once or a twice a year only. 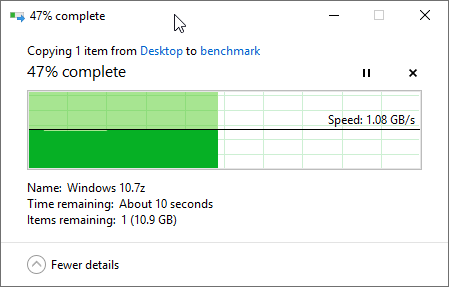 Not that I want to question your results but... copying a 3GB file over ~3GB/s bandwidth takes 1 sec which... wouldn't probably even trigger the Windows copy progress dialog (it has around 1sec threshold on copy/move time and just beyond that it will pop up that progress dialog). How did you manage to take that screenshot anyway? for NAS.. I just need to setup freenas and give a whirl on file copies and see if that issue goes away. all of them are using wd red or ironwolf drives spinning at 5400rpm and some using 40gb networks... well that is what got me. I cant get 10gb to file copy without hitting cache limits so wasn't sure why they are not. don't care about redundancy as I never keep stuff I'm afraid to loose on it. now I am on windows, so I get that.. and that is what I'm trying to figure out. how are you turning cache on and off? is it built to the 970 evo nvme? 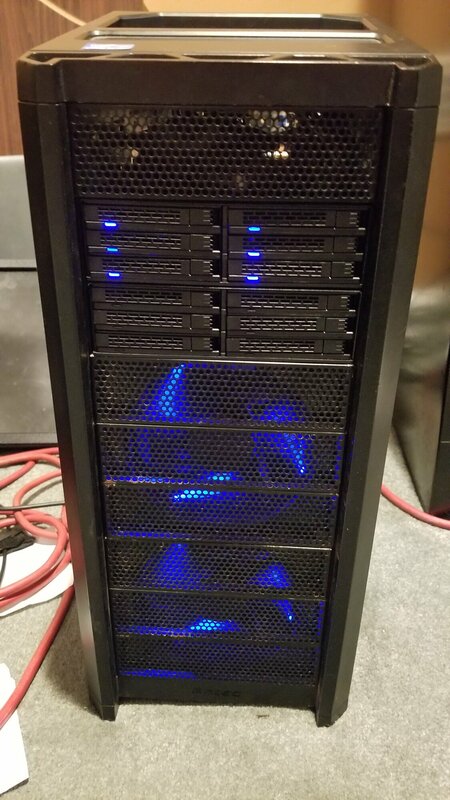 For high speed and keeping costs down you could do a group of 6-7 drives around 4-8TB, and set them as either a RAID5 if you want more space, or RAID6 if you want a little extra redundancy. Then get one of those new 970 EVO Plus drives that are about to launch in a 1TB capacity (for $250) and use that as a cache for the raid array. Just tell it to split the cache 50/50 for read write, and set it to free write cache on written data. That way the write cache doesnt really fill up and you keep the drive between 25-50% empty always for good speed. I use PrimoCache software. Been using it since way back when it was called FancyCache in the beta. With the RAMdisk you are copying a file into the memory disk, then copying it to the server in its memory disk right? So basically it is just a super tiny but very fast drive that you have to use manually. It isnt really cache at all. With actual software to make a cache space over your drives you dont have to do anything beyond that, the cache works on its own behind the scenes seamlessly. You could get an Optane drive (or other SSD should work too) and set up Intel's cache software, or get other 3rd party software like PrimoCache, ExpressCache, MaxVeloSSD. In the advanced area of the driver in device manager, I have a TON of options. I turned up my receive side scaling (how many processors the NIC uses) to take us of all my CPU threads, and I changed the transmit and receive interrupt type from normal to low latency, changed my send and receive buffers to be better tuned, and turned back on jumbo frames. The jumbo frames does the most help in sequential transfer speed, and the low latency tuning and buffers help bring up the small file size transfers. Most people dont like jumbo frames, but I use it on my internal 80gb network and just let my router split the packets down to 1500 when necessary for external traffic. Works well and I have never had an issue. The router CPU never even goes above 10% so its no big deal to me to let the router do more work. so here are 2 pics I took a bit ago... when I asked a question on the stable bit ssd optimizer.. no one has replied.. but these pics show it..
My guess would be the issue is with the StableBit software more than anything else. It is probably causing a lot more disk usage and CPU usage to software pool data like that, and it could be that their SSD cache software just isnt very good. The behavior of their cache looks ways off like it isnt even truly being used. so Ive been pulling my hair out (what little I have left..)..
tried so much then I said wait.. all this testing ive been doing is on my plex box to my server as they are ontop of each other. so I went and tested .. yup 750MB/s+ …. it just returns a command prompt.. wonder if there is something odd there and that is hurting it. will do.. my machine that is only getting 400's is via ramdrive to ramdrive... so its definitely the network on that one machine. most likely something with that machine. I even swapped cards as I have a few and still not as fast .. albeit almost half as fast..
so are we saying that the windows screen that shows speed/time is just wrong? and that I am actually running faster on my 10gb gamer than my 10gb plex? The network tests do in fact say you are getting 10gb speed on your network between your gamer PC and the server. The problem is drive related. Did you install PrimoCache software and try that? I would try putting the trial version of that on your gamer PC and the server. Set an 8GB cache on both computers if possible, and manually partition it at 4GB read, and 4GB write. Then leave the PrimoCache window open on both computers. Find a 3 to 3.5GB file and copy it to the server. As soon as you start sending it, watch to see if your pc had its free space in the read cache go down, and then go and look if the free space in the write cache went down on the server. As soon as you are done transferring the file, delete it on the server and then copy the same file again. This time it should be in cache on your gamer pc, so speed should easily max out your network. If that worked, then it is just simply a drive related bottleneck on your pc. 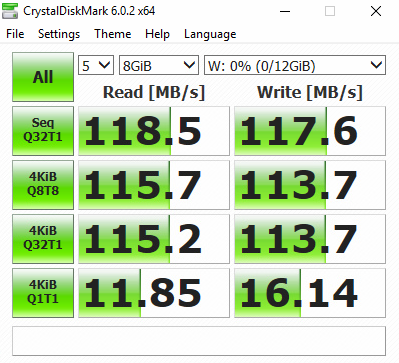 As sata based SSDs do not have the speed to saturate a 10gb network. 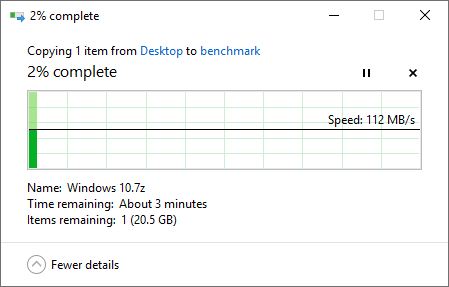 The only thing faster than 10gb right now is newer nvme drives. I did install primocache but didnt get to start messing with it. Got busy. Thing is.. 400 is ramdisk to ramdisk so not drive bottleneck. if you are already transferring to and from RAM and it still runs 400-450MB/s, then honestly I dont know. it has to be something on your computer itself, as iperf shows you are clearly getting near 10gbit on it. It even shows higher than your PLEX to server speeds. So it has to be something on the computer itself causing a major filesystem bottleneck. but got my hp procurve switch updated.. woooot.. and no new featuers. there really isn't much to set in these things. Nice. That is your full 10gb speed right there. got enough ssd drives to be happy with... and still enough spinning drives to offload too for redundancy. not sure how im going to do that yet.. contemplating just keeping my important fast access stuff on ssd and when I copy to ssd, robocopy over to spinning drives do duplicate. antec 900... got life again... gonna replace fans as these are toast..